The next batch of all-time CLASSIC hip-hop anthems from the Nervous vaults, pressed onto high quality dinked 45's. Collectors and DJ's take note! 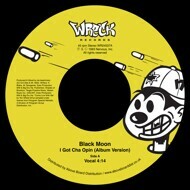 The original LP version of the slamming underground jam 'I Gotcha Open' from 1994 sees Black Moon doing what they do best - spitting some serious heat over more Beatminerz grooves. It's all here, the filtered bassline that is a straight Beatminerz trademark, paired with some killer echo-laden drum programming and those sick horns! The perfect vehicle for the Buckshot Shorty to get loose with his inimitable style. This is that classic mid 90's flavour, classic from end to end. If that wasn't enough for you, you get blessed with Evil Dee & Mr Walt's instrumental on the flipside which will definitely get you open, fronting is optional but not advised! You have been warned.